The Seahawks have signed free agent running back Eddie Lacy to a one-year contract worth up to $5.5 million. After struggling with their running game in 2016 in what was the first season of the post-Marshawn Lynch era, the Seahawks took an aggressive step Tuesday toward adding competition to their backfield by signing free agent running back Eddie Lacy to a one-year deal. The agreement was first announced by his agent and was reported to be worth up to $5.5 million with $3 million guaranteed. Lacy was one of four running backs in which Seattle has expressed interest since the free agent signing period began on Thursday, and Lacy visited Seattle over the weekend. Adrian Peterson also visited Sunday and Monday while Jamaal Charles is still expected to visit Wednesday, according to ESPN’s Adam Schefter. Latavius Murray also had been expected to visit but is headed to Minnesota today to visit a Vikings team that could be interested in filling an immediate need with Peterson likely gone. Lacy will add to a backfield that also includes Thomas Rawls and C.J. Prosise, who each dealt with injuries last season, limited to a combined 15 games with Seattle rushing for just 99.4 yards per game in 2016, 25th in the NFL, after ranking in the top four in rushing each of the previous four years. Lacy also becomes the first of the big-name running backs to sign a free agent contract. There had been a thought that Seattle would wait until all of its visits to sign a running back and might wait until the free agent market at the position had set itself some. Instead, the Seahawks took the plunge this morning with Lacy, apparently satisfied with what they saw in his visit while also possibly viewing Lacy as more affordable than Peterson and unclear of what the market may be for the other two (though some early judgments of the deal, such as this from ESPN’s Bill Barnwell, wondered if the Seahawks paid too much). Two questions surrounded Lacy — the status of a surgically repaired ankle and his weight — which helped lead to Green Bay’s decision not to immediately re-sign him and allow him to become an unrestricted free agent. Lacy played just five games in 2016 before suffering a season-ending ankle injury that required surgery to insert two screws, two wires and a plate into the ankle. Lacy, who will turn 27 on June 2, was the 61st overall pick of the 2013 draft, taken a spot before Seattle selected Christine Michael. He rushed for 1,178 and 1,139 his first two seasons in the NFL before weight and injury issues slowed him the last two seasons. He was on his way to a bounce-back year in 2016 with 360 yards on 71 carries, a career-high average of 5.1 yards per attempt, before being sidelined. He has 3,435 yards on 788 carries in his career with 23 touchdowns and 101 receptions for 900 yards and six touchdowns. Lacy, who was the AP Offensive Rookie of the Year and made the Pro Bowl in 2013, has also had battled questions about his weight throughout his career. Listed at 234 pounds, he has at times been thought playing 20-25 pounds above that — now Seattle teammate Michael Bennett famously called him “slightly overweight” prior to a game in 2015. 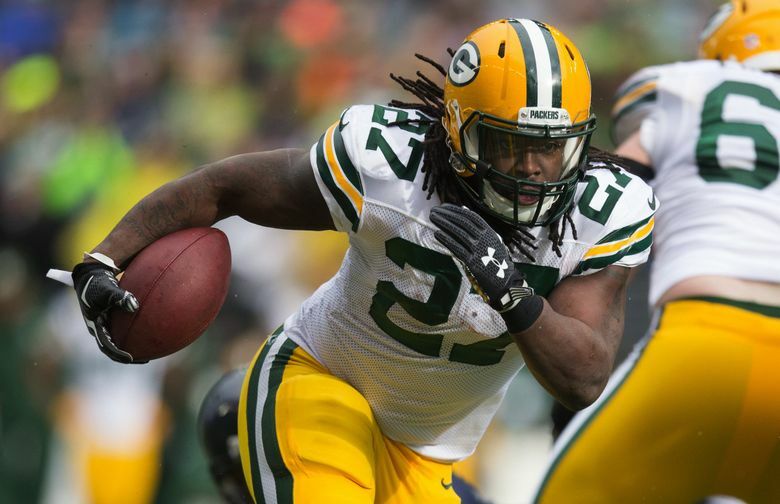 A report from Bob McGinn of the Milwaukee Journal-Sentinel stated that Lacy weighed in at 267 pounds for one of the three teams he visited in the last week — Seattle, Minnesota and Green Bay. (Here’s a picture of Lacy from Saturday). That the Seahawks signed Lacy for just one-year mitigates the overall commitment. But the money suggests the team sees a substantial role for Lacy, who will likely compete with Rawls for a starting spot with Prosise potentially slated at the beginning largely for the third-down back role that the team initially drafted him for in the third round last season. Seattle also has on its roster at tailback 2016 fifth-round pick Alex Collins and undrafted free agent Troymaine Pope. But Pope also suffered a season-ending ankle injury last season, and the Seahawks had acknowledged being concerned about the injury issues at tailback. Coach Pete Carroll, asked after the season if he was concerned about the durability of Rawls — who battled a hairline fracture last season after coming off a broken ankle the previous year; and Prosise — who played just six games due to several different injuries including a shoulder issue that ended his year on Nov. 20 against the Eagles — said it had to be taken into consideration when assessing the running back spot going forward.